$1/6 Fugio Fractional Note Continental Congress. February 17, 1776. Plate B. Signed by Phillip Kinsey. Imprint of Hall and Sellers. Face and back motifs created by Franklin. Face emblem, at right, sundial with blazing sun shining, FUGIO in left circular border, MIND YOUR BUSINESS in the exergue. Border cuts on all sides with obligation in left center. Back with interlocked thirteen link chain with names of the first colonies, this encircling rayed central motto WE ARE ONE within circular border with AMERICAN CONGRESS. These powerful Franklin inspired motifs created from his early Poor Richard’s almanacs. Fractional denomination notes, $1/6 to $2/3, are the only ones seen in the entire Continental Congress series. They are fractional Continental Dollar notes utilizing the Franklin’s Fugio design. An emission totaling $4,000,000 payable in Spanish milled dollars, or the equivalent in gold or silver, was authorized by the Continental Congress resolution of February 10, 1776. Of this $1,000,000 was reserved for the first national fractional currency. The front design on the fractional notes includes the first use of the "FUGIO" (I fly) legend and sundial as well as the "Mind your Business" legend. The back shows the thirteen linked rings representing the colonies and the legends "We are one" and "American Congress". Eric Newman has discovered these designs were created by Benjamin Franklin (see his indispensable The Early Paper Money of America p. 53). Note that on the fractional bills the dots in the corners of the front design reflect the denomination, with one dot designating a sixth of a dollar, two dots for a third, three dots for $1/2 and four dots for $2/3. Also, fractional denominations come in plates A, B and C. Again it was Newman who discovered the devices and border designs for the fractional bills were cut by Elisha Gallaudet, who also designed the Continental Currency coin. There is one signer, in red ink, on the fractional bills and two signers, using red and brown ink, on the dollar denominations. Counterfeit detectors for the dollar denominations were made on blue paper. The Franklin designs were adopted for the Continental Currency coin made a few months later and for the 1787 Fugio cents. The paper, made at Ivy Mills in Chester County, Pennsylvania, contained blue fibers and mica flakes. 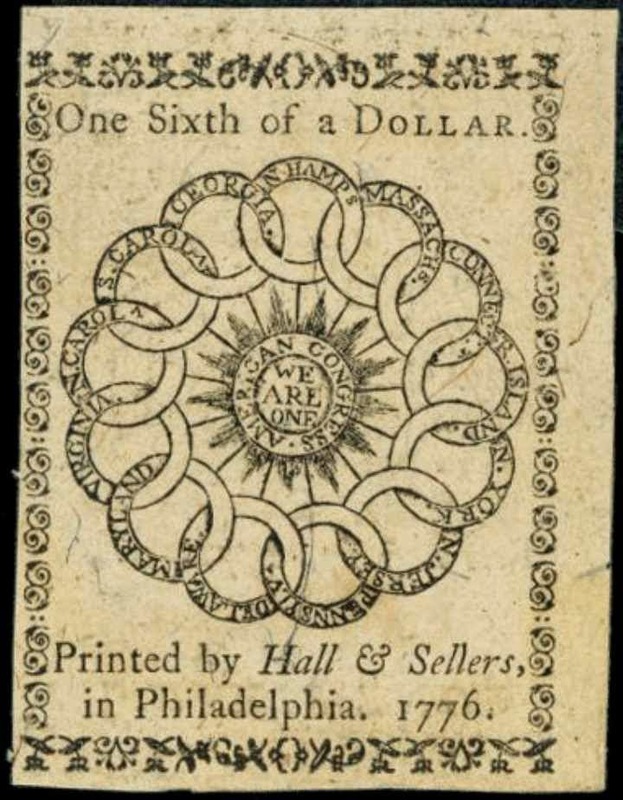 Printed by Hall and Sellers in Philadelphia. Denominations printed were the: $1/6, $1/3, $1/2, $2/3, $1, $2, $3, $4, $5, $6, $7 and $8.